Is BenVia Gold the same as chia? It’s even better! Is BenVia Gold the same as chia? At first glance, the answer is simple – BenVia Gold is chia. But it’s really a bit more complicated – BenVia Gold chia is better. There. We said it. BenVia gold is a superior chia than the other options. And we’re going to tell you why. No matter what is being grown, the nutrients in the soil play a part in the nutrition levels of the crop. If the soil is overworked, or over-farmed, the nutrients no longer infuse the crop. Chia seeds are no different. Which is why our producers grow BenVia Gold chia in the richest, most nutrient saturated soils of Bolivia. They use no-till farming, direct sowing, and rotation practices that protect the soil. All this means BenVia Gold chia seeds are nutritionally packed, every year, every harvest, every time. Part of maintaining that rigorous standard of soil quality – and, in turn, chia quality – is to minimize the chemicals applied to the crop. BenVia Gold chia is grown with no weeding or pesticide chemicals added. None. All weeding is done 100% by hand. The growing sites themselves were chosen specifically for their soil sustainability. Most of them are in environmentally protected areas, so steps must be taken to protect the areas. These steps contribute to the consistency of BenVia Gold chia by insuring the continued existence of the indigenous plants and animals that have contributed to the soil’s richness from the beginning. The producers of BenVia Gold chia also see a bigger picture than just this harvest – or even the next several. They also understand the need to be socially responsible, as well as environmentally so. Local farmers, workers who care about the land, are hired to work and harvest the chia crops. They are paid fairly for their work, and the communities are supported as well. In fact, each person involved in the production of BenVia Gold chia receives regular training to keep them current with changing technologies and best practices. This business decision insures that BenVia Gold chia producers are trained experts who know – and care about – the land, the soil, and what is best for long-term sustainability. BenVia Gold chia has received international certifications of quality assurances throughout the entire production process. They have received the GAP certification for Agricultural Process; GMP and HACCP for Selection and Cleaning Process; Organic Certification; and ISO 9001 certification for Manufacturing and Commercialization Process. These guarantee product traceability, controlled quality, a 99.9% level of purity, a strong production forecast, and ongoing monitoring and improvement of operations. Which all sounds really impressive but…what does all that mean? That means that we aren’t the only ones telling you BenVia Gold chia is quality guaranteed. These organizations are at the forefront of quality control all over the world - and BenVia Gold chia has been granted every one of these certifications. Is BenVia Gold Chia better? In a word, yes. And it’s not just our opinion. It’s backed up by national and international third parties. Our procedures and best practices are, well, best. Sure, you can get other brands of chia lots of places. And some of it is even cheaper. But the only place you can get BenVia Gold chia – and the quality assurances that come with it – is here at NorthStar Nutritionals. That’s a lot of reassurance for a little extra money. That’s BenVia Gold superiority. What is BenVia Gold Chia? And how do I use it? We are very excited about the response we’re getting to BenVia Gold chia seeds. People are beginning to realize just what an amazing food chia is. They are learning that BenVia Gold chia is bursting with calcium, fiber, omega-3s and protein. They’ve read how a single scoop of Benvia Gold can change their health – and you can, as well, right here. If you’re more of a visual person, this infographic shows the incredible benefits of chia and how it can transform your health. But just because people are learning about BenVia Gold chia doesn’t mean all the questions have been answered. Now that you know what BenVia Gold is, you probably have some “how questions” -- how do I use it…how often…how much? Well, we’ve got answers for you… How Do I Take BenVia Gold? BenVia Gold is one of those great supplements that can be taken in so many ways. For those of you who like a bit of texture, we offer whole seeds. They give a little bit of a pop and a crunch, very similar to a whole flax seed – only with even more nutritional power. For those of you who would rather have it less noticeable, we also offer ground BenVia Gold. When mixed with water, it doesn’t dissolve, but turns into a gel instead. This is known as chia fresca, and it has so many uses. It can thicken soups, smoothies, or shakes. Some people even use chia fresca as an egg or butter replacement in recipes. How Often Should I Take BenVia Gold? You can take BenVia Gold every day. In fact, there are people who find the effect to be cumulative and don’t want to miss a single day. Other customers swear they can tell a difference in their energy levels, and overall sense of well-being, on days they take BenVia Gold over days they forget. Either way, BenVia Gold is a safe, effective daily treat. How Much BenVia Gold Should I Take Every Day? You can take up to one whole scoop – 15 grams – of BenVia Gold each day. Feel free to split that up however you want. Some people like to sprinkle the whole scoop over a salad, or bake it into their favorite treats. Other people will dole the scoop out into their foods over the course of a whole day. It’s entirely up to you! How Should I Prepare BenVia Gold? The sky’s the limit! Because BenVia Gold can be eaten raw or cooked. It doesn’t break down because of heat. It doesn’t dissolve in liquid. It has almost no taste, beyond a slight nutty flavor, on its own. So, you can prepare it just about any way you want. Bake it into casseroles. Stir it into yogurt or homemade soups. Blend it in a smoothie. Sprinkle it over pasta or salad. Add it to your favorite banana bread recipe. BenVia Gold is so versatile, you’re only limited by your imagination. And if you want more suggestions, we can help with that, too. Our new BenVia Gold cookbook is full of delicious, kitchen-tested recipes. BenVia Gold is one of our favorite products because of how much you can do with it. So try it yourself. And then let us know your favorite way of using BenVia Gold. Maybe your recipe will be the favorite in our next cookbook. BenVia Gold Chia Seeds vs Fish Oil: Is Chia better than Fish Oil? Most people know that omega-3s are good for heart health. Maybe you’ve been taking fish oil supplements for years. But now that you’re hearing about chia seeds, you’re starting to wonder if BenVia Gold Chia is better than fish oil. It’s a good question. The amount of omega-3s in fish oil can be equal to the amount of omega-3s in BenVia Gold, depending on the dosage. So, that’s easy. But the difference comes into focus once you look at the type of omega-3. A basic rule is that animal products – including fish – have cholesterol. Vegetable products do not. If one of the reasons you take omega-3 supplements is to help control, or even lower, cholesterol levels, it makes sense to take a supplement that doesn’t contain cholesterol. Fish has been identified as one of the top four allergens in adults, along with peanuts, tree nuts, and shellfish. Anyone who suffers from a fish allergy will be effected by fish oil supplements. However, people who have allergies to mustard – a much rarer condition, but one that deserves mention – have reported being allergic to chia. BenVia Gold chia is grown and harvested under strict conditions that maintain the soil’s nutrient levels. This, in turn, retains the nutrient quality of the chia used in BenVia Gold. The same cannot be said for the fishing industry. Along with high levels of natural cholesterol, fish is high in mercury. While most people don’t have to worry about mercury poisoning from eating fish, it is common enough that the EPA and the FDA issue annual warnings about fish consumption. And women who are pregnant, nursing, or planning on becoming pregnant should avoid mercury altogether. Due to overfishing, and pollution, the fishing industry is struggling with quality control, as the pollutants are getting into the final product being offered to the public. No amount of purification can completely decontaminate the fish oil used in supplements. Some people say BenVia Gold has a slight, nutty flavor. Others say it has no flavor at all. But many people report a fishy taste when they take fish oil supplements. Often, it’s so bad it prevents people from being able to take the pills. Another frequent complaint with fish oil is heartburn with burping or belching as the supplement digests – which is often is accompanied by the fishy aftertaste. We haven’t received any such complaints from BenVia Gold users. At first glance, it might seem like fish oil is a better deal in terms of price. After all, you can pick it up for less than $20 at your local drugstore. However, as we mentioned earlier, the fishing industry is struggling to maintain the quality of its products – including fish oil supplements – these days. That’s across the board, not just with the no-name or knock-off brands. The whole point of taking supplements is to make us healthier, not risk further damaging our bodies. And BenVia Gold is very reasonably priced, especially when you consider the quality you’re guaranteed. Balance saving a few extra pennies with getting a premium product and absolute quality assurances, and we think the choice is clear – BenVia Gold chia seeds. Naturally, you have to weigh out the pros and cons for yourself. There are definitive and obvious differences between BenVia Gold chia seeds versus fish oil supplements. But if fish oil hasn’t been giving you the results you want, you’re concerned about quality, or you’re sick of the fishy taste, you have a great option. BenVia Gold gives you all the benefits of fish oil with none of the drawbacks. Try BenVia Gold and take 25% off your first order. Just click here now to go to the NorthStar Nutritionals website (www.northstarnutritionals.com) and use promo code W650Q2ZD to get your 25% discount. And remember, if you try BenVia Gold and you’re not satisfied for any reason, you’re always covered by our Gold Standard Guarantee – all of your money back any time, for any reason (less shipping). Click here to try BenVia Gold today. Whenever you add a new supplement to your diet, you already know about its benefits. Otherwise, you wouldn’t be adding it. But what about its side effects? No matter how effective, or useful, something is, it’s important to be aware of any problems that may arise. Knowing the side effects of BenVia Gold is no different. Most of the side effects reported with using BenVia Gold, or chia seeds, occur when using unusually large amounts of the seed and are caused by one culprit: fiber. For most people, these BenVia Gold side effects can be avoided by using the recommended amount – 1 scoop per day. Still, they are worth talking about. Most of us don’t get enough fiber in our diets. Because of this, when we add fiber to our daily routine too quickly, it can often cause physical discomfort, including mild cramping, bloating, even occasionally diarrhea. Since BenVia Gold is high in fiber, some people may experience this adjustment period. One way to minimize the effect of the fiber is to spread the amount of BenVia Gold you take throughout the day. Instead of using the entire scoop with breakfast, use a third of it with every meal. The good news is these symptoms of this chia seed side effect will decrease, and eventually disappear, as our bodies adjust to having enough fiber working in our systems. Is BenVia Gold Worth It? Yes, definitely. First, the benefits of BenVia Gold reach far beyond just the amount of fiber you will get. BenVia Gold chia benefits your system in so many ways, providing amazing support to your blood pressure, blood sugar, cholesterol balance, energy, skin, digestion and so much more. For complete details on all the health benefits of BenVia Gold chia, check out this article. Or if pictures are better than words for you, take a look at this awesome infographic. But aside from the benefits of BenVia Gold chia, fiber itself is good for us. Most of us don’t get enough in our diets. And fiber does everything from help keeping us regular to promoting heart health. Adding BenVia Gold to our diets gives us all the benefits of chia – including healthy amounts of fiber. Everything has side effects, especially if used incorrectly or improperly, even something as essential as fiber. So, while we won’t say there are no BenVia Gold side effects, we will say that they are almost all avoidable. When used correctly, BenVia Gold will improve your health and make you feel better. It’s that simple. More isn't always better – but feeling good always is. To learn more about BenVIa Gold, including how to purchase it, click here. 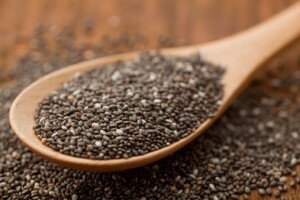 What are the health benefits of BenVia Gold chia? BenVia Gold is 100% pure chia seed. We only accept the highest quality seeds available. So, one scoop can provide you with all this: Calcium (79 mg – a little more than ¼ cup of milk): As you know, calcium is essential in building healthy bones. It keeps our teeth and bones strong, even as we age. Fiber (6 g – 1 ½ cups cooked instant oatmeal): Fiber keeps our digestive tracts healthy, from the stomach to the colon, which helps prevent problems. It also makes us feel full, which can be useful in maintaining a healthy weight. Iron (1 mg – more than 1 cup of raw spinach): Iron is one of the minerals that keeps blood healthy, giving it that deep red color. Iron deficiencies can cause anemia. Magnesium (49 mg – 2 tablespoons of peanut butter): An entire article could be devoted to the benefits of magnesium. It’s required for healthy muscle and nerve function. It keeps the heart rhythm steady. Like calcium, it helps keep bones strong. Plus, it supports our immune systems. It regulates blood sugar, and keeps blood pressure normal. And BenVia Gold is a good source of it. Omega-3 (2775 mg – 7 to 8 whole walnuts): What isn’t omega-3 good for? It keeps our brains, skin, and hearts healthy. It reduces inflammation in muscles and joints. It even allows us to think more clearly, and may stave off age-related memory lapses. Protein (3 g – ½ inch cheese cube): Protein is required for proper nutrition and to prevent muscle atrophy. Riboflavin (.03 mg – 3 sundried tomatoes): Also known as B-2, this vitamin protects against premature aging. It breaks down nutrients into energy. And even interacts with iron, enhancing iron’s efficiency. Thiamin (.07 mg – 3 ½ medium sized apples): Most people know thiamin as B-1. Our favorite use for thiamin is that it helps the body handle stress. But it also maintains the cardiovascular and nervous systems, promotes healthy skin, hair, and eyes, and converts carbohydrates into energy. BenVia Gold offers all of this, in one 15 gram scoop. 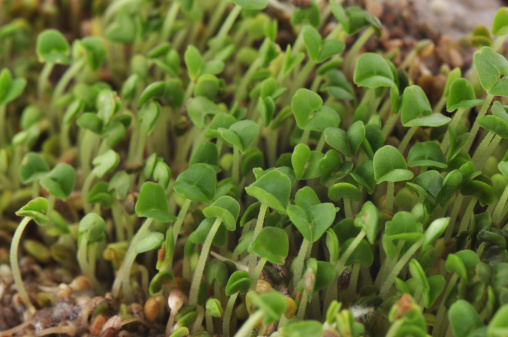 That’s a huge list of health benefits for such a tiny seed. You’ll get the health benefits of BenVia Gold no matter how you prepare it. Eat it raw, or cook it up. Sprinkle it on salads or cereal. Bake into your favorite breads, or our favorite -- brownies. BenVia Gold is available in 2 forms, whole seed or ground, however you prefer it. Either way, the health benefits of BenVia Gold are the same. For more information about chia in general, check this out infographic – Chia: The Perfect Food for your Perfect Health. But know that BenVia Gold chia is some of the best available, thanks to our highly controlled growing conditions and commitment to quality. BenVia Gold has more nutritional value than many forms of generic chia, thanks to the nutrient rich soil in which it is grown. Now that you know the impressive health benefits of BenVia Gold, life doesn’t have to slow you down any longer. All you have to do is give it a try. BenVia Gold will do the rest. Is BenVia Gold a scam? This is a question we get from time to time. So we’re happy to talk about it and give you an honest review of BenVia Gold. But first, let’s back up a minute and talk about chia seeds in general. There are lots of claims out there about chia seeds, so it’s easy to think some of them are far-fetched. Some companies claim that chia seeds will help you lose weight, and this simply hasn’t been supported. But study after study has proven the overall health benefits of chia seeds – and every claim we make about BenVia Gold has been backed up (and we have the documentation on file to prove it!). So here’s an honest BenVia Gold review, to set the record straight. Here’s what we know about BenVia Gold… …BenVia Gold gives you energy. As long ago as 3800 BC, the Mayans named chia after their word for “strength.” And the Aztecs called chia seeds “the running food” because of the energy and endurance their warriors experienced after eating them. Today, athletes report that same endurance boost, thanks to chia. …BenVia Gold assists with regularity and digestive issues. Fiber has been known to promote regularity for as long as anyone can remember. A diet full of fiber helps keep our intestinal tract healthy and moving properly. 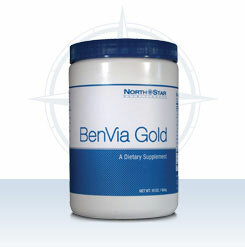 BenVia Gold gives you 24% of your daily recommended allowance of fiber in one single scoop. …BenVia Gold helps you manage your weight. But wait, didn’t we just say that weight loss claims haven’t been proven? We did, but that doesn’t mean BenVia Gold is a scam. Other chia seed suppliers may claim that their product will actually cause you to lose weight. But that’s not what we’re saying. What we know is that the fiber that helps keep you regular also helps keep you feeling full. And when you feel fuller, it’s easier to manage your weight. Plus, one scoop of BenVia Gold is only about 55 calories, giving you the full feeling you need, for less than 100 calories. …BenVia Gold supports your cardiovascular system, including blood pressure and cholesterol levels. It’s packed with the fatty acids – Omega 3, Omega 6, and Omega 9 – that are shown to support heart health, which keeps our arteries and blood pressure healthy, too! Plus, Omega 3s help raise the levels of good cholesterol and support healthy triglyceride levels. …BenVia Gold can help you look younger. Those same omegas are important to healthy skin, hair, and nails. A serving of BenVia Gold gives you over 3,800 total milligrams of omegas, plus calcium to help keep your teeth and bones strong, too. Is BenVia Gold New? BenVia Gold may be relatively new to the market, but chia isn’t. 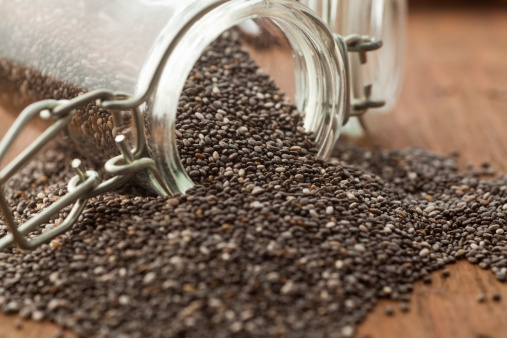 It’s believed the Aztecs used chia seeds centuries ago. And modern research into their health properties started over 20 years ago. In fact, long-term customers of NorthStar Nutritionals may remember Salba, which was the first chia we offered. Even though we decided not to offer Salba any longer, we were too impressed with chia to stop offering it altogether. That’s why we now have BenVia Gold. Because we want to make sure you have access to all the benefits promised by chia. Although BenVia Gold was originally harvested by the mighty Aztecs in modern day Mexico, today the golden crop thrives further south in Bolivia. You see, Bolivia has the ideal climate and a pristine environment for BenVia Gold to grow in all year long. It’s grown under controlled conditions in some of the most nutrient-rich soil in the world. Because the soil's natural nutrient stores have never been depleted, BenVia Gold is packed with more naturally occurring beneficial vitamins and minerals than many fruits, vegetables and dairy products farmed elsewhere. The growers also take great care in harvesting under strict guidelines to maximize the total nutritional benefit, which means crops are harvested only a few times a year. All while worldwide demand continues to skyrocket. 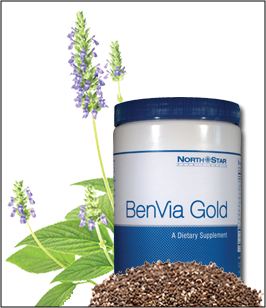 Happily, though, NorthStar Nutritionals has been designated BenVia Gold's premier U.S. supplier. Our Gold Standard: Our Customers’ BenVia Gold Reviews So you see, there’s no BenVia Gold scam here. BenVia Gold is real. And its health benefits are very real. Not only do the science and medical communities back us up, thousands of our own customers agree – which is the BenVia Gold review we care most about. But if you’re still skeptical, just give BenVia Gold a try for yourself. If it doesn’t work, or you don’t like it, you can return it at any time for any reason, thanks to our Gold Standard Guarantee. But, we’re sure you’ll come to believe in BenVia Gold as much as we do. I've got a riddle for you. Ounce for ounce, what has 5 times more calcium than whole milk, 12 times more magnesium than broccoli, and 3 times more antioxidant power than fresh blueberries? It's the powerful and "perfect" whole food Benvia Gold. Just a sprinkle of these super seeds can deliver support for your blood pressure, blood sugar, cholesterol balance, digestion, skin, energy levels, and more. These seeds put the super in superfood, testing off the charts! And, ironically, it's been sitting right under our noses for over 500 years. Click here to listen to a special report I've recorded about this incredibly special superfood.